According to a recent study, human ingenuity will provide Terrans with far more star systems than the Zerg or Protoss. When discussing scientists, it's worth remembering that after developing technological telepathy or dragging asteroids to the moon, many kick back with the latest games like anybody else. Even when we take to the internet to discuss the finer points of our chosen hobby, science is there; the only difference is it'll bring algorithms and experiments along for the ride. Case in point: Two research astronomers have analyzed the outcomes of Starcraft II multiplayer matches, and extrapolated their findings into a model for competitive intergalactic expansion. In the full study, Dr. Thomas Targett and Dr. Duncan Forgan make a convincing argument that while the Zerg and Protoss are formidable, it's actually Terrans who would most effectively colonize the stars. 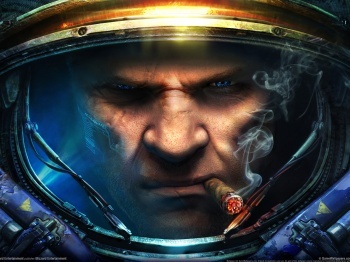 Targett and Forgan, two postdoctoral research fellows from the University of Edinburgh, performed 100 Monte Carlo Realization simulations to plot out how Starcraft II's races would expand in a section of the Milky Way Galaxy. Anytime two races encountered each other during a simulation, the victor was determined using a randomized algorithm based on 500 Starcraft II match outcomes. Eventually, Targett and Forgan found themselves with a series of galactic maps summarizing how effectively each species had expanded and overlapped with each other. Targett and Forgan's findings suggest that when it comes to space colonization, the Terrans of Koprulu Sector are by far the safest bet for rapid and successful expansion. At first, the Terrans may not seem the obvious choice, as Blizzard Entertainment balanced them pretty effectively against the Zerg and Protoss races. The deciding factor comes down to tactics. Targett and Forgan found that "a strategy of early pressure against their opponents" gives Terrans a statistical advantage on the battlefield, which by association, ultimately rewards them with the most star systems. By the way, before anyone jumps to the "why is science wasting its time" argument, please note that Targett and Forgan are way ahead of you. This Starcraft II study was conducted entirely during the pair's off-work hours for the purpose of highlighting "the increasing scientific potential of the rapidly expanding videogame industry, while also increasing public understanding of the scientific method". In fact, it won't even be featured in any scientific peer-reviewed journals, although I would love to see the community's rebuttal. Still, Targett and Forgan will have no shortage of Starcraft peers who can discuss the study in forums and comment threads. Just note that if you're going to argue why the Zerg are superior, the bar has just been set rather high.